For the long Thanksgiving weekend, I did a trip to Washington D.C. where I haven’t been in 10 years. While waiting for my outbound flight back home, I had enough time to visit the American Tap Room at Terminal C Gates 35 to 45 of Reagon National Airport. Even so American operates out of Terminal C Gate 35 to 45 the American Tap Room is not linked to the airline. However, you get a $28 dining credit if you hold a Priority Pass and a same-day boarding pass. Show both to the waiter before ordering. Finding the restaurant is one of the easiest things. 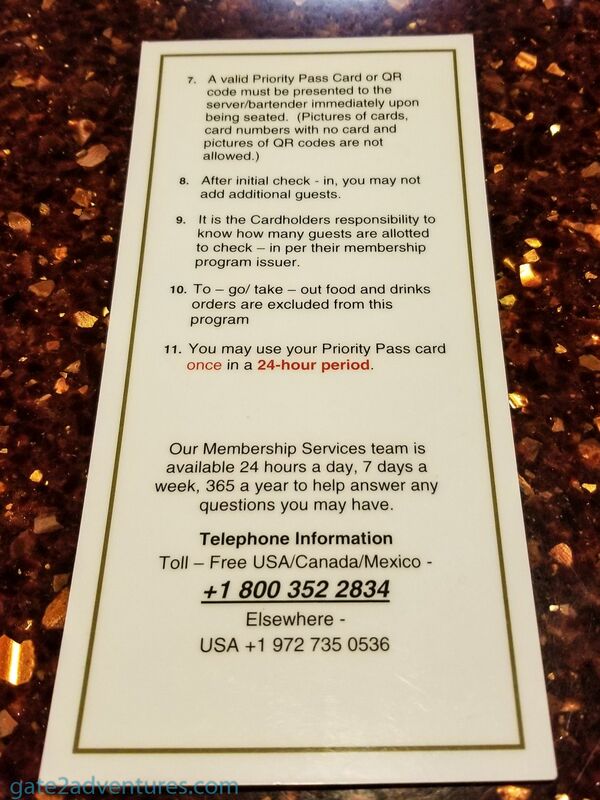 Once you pass through security you can already see the restaurant to your right. Located across the gates 35 and 35X. I came here on a Saturday afternoon of a holiday weekend and it was pretty crowded. Only two tables were available while I walked up to get seated. While I waited to be seated, a waiter just told me to sit where ever I like and she will be right out. After sitting down, it took only a few moments until my waiter showed up. I ordered my food and was hoping the total bill would be under $28. My waiter took my order and came back a few moments later with my Coke. But after that, it was a long wait to get my Bavarian Pretzel. But the wait was worth it. The Pretzel was still warm, just as I like it and the dips were delicious as well. Even tho, I can’t remember that it is Bavarian Tradition to dip Pretzels. In Bavaria, the Butter-Pretzel is more of a tradition, where you cut the pretzel open and put butter inside and fold the pretzel back together. Anyway, this combination of Bavarian and American tradition turned out to be a pretty good appetizer. After I finished my pretzel I probably had to wait another 15 minutes or more to get my burger. The burger was ok, but the pretzel was definitely better. Next time, I probably just order multiple pretzels instead of anything else. Now it took again a long time until my waiter would come back to bring my check. 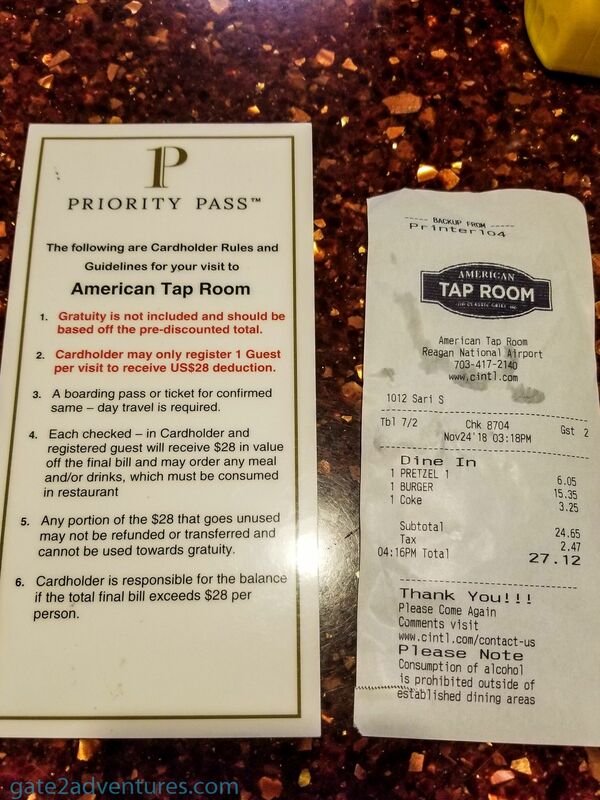 With the check came also a short instruction that gratuity is not included in my bill and should be paid separate either in cash or by card. As a points collector, I went with the credit card option, but that was another delay. It took her quite a while to swipe my card to get me a receipt to tip her. Even tho, I wasn’t to thrilled with the service, I still left a pretty decent tip. I know the restaurant was crowded but there were also a few waiters working and the restaurant is not that big. So my suggestion if you want to dine here and the restaurant looks pretty full, make sure you have enough time to dine here. I would suggest about 45 minutes or more, just to be safe. As this part of the terminal is pretty small, you can reach all the gates from the restaurant within a few minutes. Besides the airport location, there are two more American Tap Rooms in the area. Find out more about the restaurant here.